Matanzas has been called the Athens of Cuba, for its poets, and the Venice of Cuba, for its bridges (there is, no doubt, a connection). But to me, Matanzas is the City of Secrets. What treasures lie locked beneath the dark waters of its harbour, the deepest in all of Cuba and long a refuge of pirates? What experiences prompt such delight to spread across the grey-stubbled, dark-skinned face of Fausto when I agree to pay him to watch my car at the Parque de la Libertad? What artist carved the serpents and satyrs and armoured Spanish soldiers on a pair of 12-foot doors that stand firmly closed against an otherwise drab downtown street? 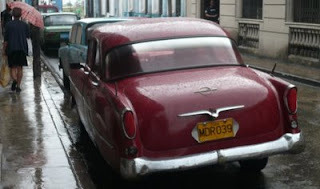 And, just a few steps beyond those doors, what red sedan is this, parked shining in the rain? At the time I snap a few shots and move on, but later, studying those photos (Matanzas, 2008), I am perplexed. Its badges look like those of an Oldsmobile, but are not. Its curved fenders imply Plymouth, but again this is a lie. 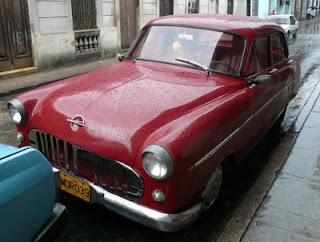 Ignore the lately added bucket seats, wind-cheating mirrors and chrome grille; this is a car from the mid-1950s, if it is American, or even the early 1960s, if, as I now wonder, it arrived from England or the Soviet Union. But what is it? I need to know. Matanzas can keep her other secrets. what the heck kind of car is that? Thanks for, er, setting the Rekord straight, Anon. I see now it's a 1959 or 1960 Opel Rekord from the P1 series. The Rekord was a big seller in Europe, and was also sold in the U.S., through Buick dealers. Here's a great site about the Opel P1. And here's a Rekord I would be proud to hold. 1. I've determined that this Opel is a Kapitän, not a Rekord. 2. The second link (to a drag race Rekord) is, unfortunately, defunct. 3. Another half billion or so users have joined the Internet. To each and every one of you: Howdy.